Veda Vyasa's legendary epic on the Bharata race was first recited in public by his disciple Vaishampayana at the behest of the ageless seer Vyasa himself. The recital took place in the noble presence of King Janamejaya, the great grandson of Vyasa, and the many learned sages who had gathered for Janamejaya's sarpa satra (a 12-year long yajna). This volume describes the lineage of the Kuru princes and the adventures of their youth. When Pandu, father of the Pandavas, dies in the forest, his wife Kunti returns to Hastinapura with their five boys. The great Dronacharya himself trains the young Kuru princes in the art of war. Bheema's feats of strength and Arjuna's skill in weaponry arouse jealousy in the minds of Duryodhana and the other Kuru sons of Dhritrashtra, Pandu's blind brother. 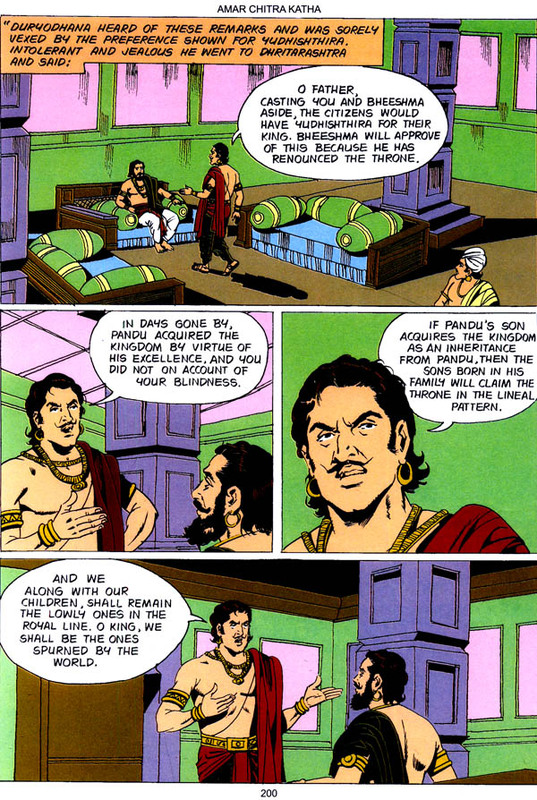 Duryodhana hatches a plot in order to exile the Pandava brothers to the city of Varanavata. Acting on a coded warning given by the astute Vidura, the Pandavas manage to escape from the burning house of shellac. The five exiled princes begin to live in the guise of mendicants at Ekachakrapura. Later, they proceed to Panchala to attend Draupadi's swayamvara. Arjuna, with a spectacularly skilful display of archery, wins Draupadi's hand in marriage. Eventually, however in order to obey their mother's worlds, all the five brother marry Draupadi with due ceremony. The Pandavas are then summoned to Hastinapura and are given half the kingdom. Veda Vyasa's legendary epic on the Bharata race was first recited in public by his disciple Vaishampayana at the behest of the ageless seer Vyasa himself. The recital took place in the noble presence of King Janamejaya, the great grandson of Vyasa, and the many learned sages who had gathered for Janamejaya's sarpa satra (a 12-year long yajna). Our previous volume described the early education of the Pandava and Kaurava princes as well as the Pandavas' narrow escape from the burning house of shellac, their marriage to Draupadi and their subsequent return to Hastinapura. This deluxe volume illustrates the slaying of Jarasandha by Bheema, the subjugation of the other kings by the Pandavas and the Rajasooya Yajna performed by Yudhisthira. Later, in a game of dice, the Pandavas lose their kingdom to the victorious Kauravas and begin to live in exile. Earlier volumes of the Mahabharata featured a series of events including the growing animosity between the Kauravas and the Pandavas as well as the costly game of dice which led to the banishment of the Pandavas for thirteen years. The adventures during the exile and the proposal for peace from Dhritarashtra conveyed by Sanjaya to the Pandavas were also narrated. 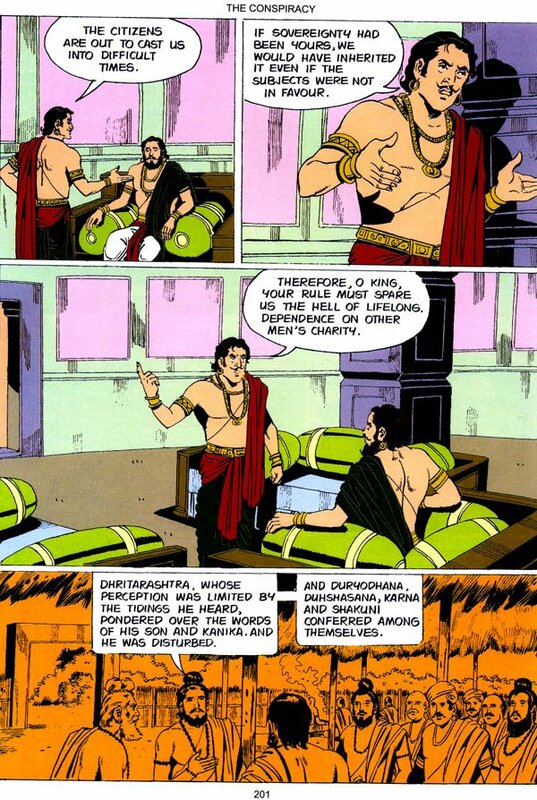 I am interested in this mahabharata comics and I would like to see insight this comics about couple pages for example. Would you please to show me? Thank for your kindness. ¿donde puedo adquirir estos libros?